As homeowner’s insurance premiums continue to rise, more homes than ever are underinsured. Here’s professional advice to make sure you’re adequately covered. For many of us, our home represents our biggest asset. And with the median U.S. house price hovering around $300K, we’re not talking small change, either. But did you know that two out of every three homes are underinsured by an average of about 22 percent? This means that, if a median-value home was deemed a total loss, the owner could pay $60K+ out of their pocket. Do you have enough cash in the bank to sustain a loss like this? Like most homeowners, probably not. Fortunately, we spoke with insurance and industry professionals about 6 most overlooked homeowners insurance gaps, and how you can make sure you’re fully insured. Part 1: What Are Some of the Most Common Overlooked Home Insurance Coverage Options? Before diving in, it’s important to point out that the specific coverage available to you can vary widely depending on the type of home you own (e.g. condo, freestanding structure, mobile home, etc. ), the state in which you live, the company with whom you’re insured, the policy type, any optional endorsements you’ve chosen, and a whole host of other factors. With this in mind, what follows are some general guidelines for all states. If you have any questions or concerns about your specific policy, be sure to reach out to your agent or insurance carrier. Do You Have Enough Dwelling Coverage? On a homeowner’s insurance policy, the dwelling coverage (formally known as coverage A) is what protects the main structure itself. Think of it this way: If you could pick up your home and shake it, everything that didn’t fall out would be considered part of your dwelling coverage. The problem is that, like many other aspects of insurance, calculating your appropriate dwelling coverage might not exactly seem intuitive—which is probably why so many homes are underinsured. But why? Insurance companies are only interested in how much it would cost to rebuild your dwelling, using similar quality materials and construction methods, if it were deemed a total loss. This is known as a replacement, or rebuild, cost. This is in stark contrast to market value, which only references what you paid for the property. And since most mortgage lenders only require you to insure the home for the amount of your loan (i.e. market value), this could leave you underinsured in the event of a loss. Pro tip: To make things easy, most agents have access to a tool called a replacement cost calculator, which can help determine your Сoverage A needs in just a few minutes, using details like your square footage, roof type, grade of interior finishes, and so forth. We’ll talk about other ways you make sure you have enough coverage on your homeowner’s policy soon. Before we get there, though, let’s discuss other common property insurance gaps. What Kind of Liability Coverage Does Your Policy Provide? However, as we just discussed, there can be a big difference in the liability limits provided by your policy (usually between $100K and $500K), as well as the circumstances under which it would pay. In some instances, even the highest limits might not be adequate, requiring you to take out an excess (also called an umbrella) policy. Do You Have Enough Personal Property Coverage? Clifton Smith of Clarksville-Hilldale Farm Bureau Insurance added that most policies have a standard amount of coverage available for jewelry, but that it’s very easy to quickly use this up in the event of a loss. As a result, he recommends insuring high-value pieces like rings and watches under a separate endorsement. Josh Berman adds that especially high-value jewelry and watches might need to be professionally appraised in order to assess their value and ensure you have enough coverage. In some instances, insurance carriers may even require copies of these appraisals, especially if you take out a separate floater policy. Do You Have Enough Water Damage Coverage? The Insurance Information Institute reports that in 2015, water damage and freezing accounted for more than 45 percent of all homeowner’s property claims. Despite this, not all water claims are viewed equally by insurance companies. In fact, Troy Peterson of Friedle Insurance in Wauwatosa, WI let us know that water-related claims are one of the most common coverage gaps he encounters. “There are many different ways water can cause damage,” he says. And ultimately, the cause of the water loss determines coverage. Improper seal around second-floor windows, requiring them to be replaced (the window replacement likely wouldn’t be covered, but if water were to leak during a storm and cause damage to drywall on the first floor, that damage is likely to be covered). Confused yet? Troy admitted that water-related claims are often confusing, so it’s best to reach out to your agent if you have specific coverage questions. Your home’s structure (coverage A). Additional living expenses if you need to live elsewhere while your home is being repaired. Your liability to others, including on-premises business exposures. Earlier, we discussed the replacement cost calculator available to most agents, which can help you determine your required dwelling coverage, including any additions or improvements you’ve recently made. If necessary, though, Sean Scott recommends getting a contractor involved to estimate what it would cost to rebuild your home if it burned to the ground. After all, your home may be the same square footage as your neighbor but could cost twice as much to rebuild if you have unusually expensive improvements. As far as natural disasters, he advises insureds to perform a risk assessment on their property to try and determine which perils are most likely to strike their area. For example, if you live in an area that has a history of flooding, get flood insurance. If you live in an area that has a risk of hurricanes, get adequate coverage for any hurricane-related damages that may be subject to lower policy limits. From an additional living expenses perspective, you also need to “figure out what it would cost per month to rent a fully furnished home of similar size and location as the home you live in, for a period of 18 months,” Sean says. But, what about other coverage sections, such as personal property and liability? How Does a Home Inventory Work? 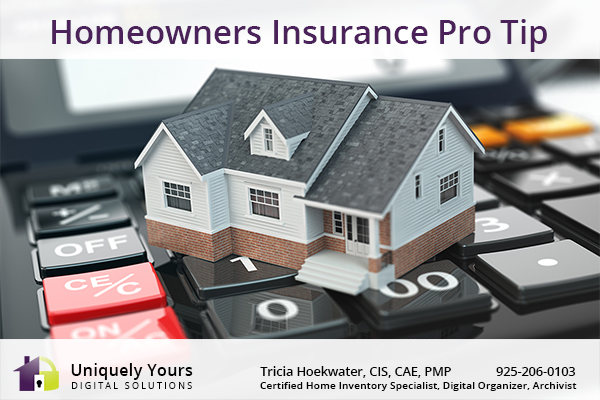 According to John Bodrozic, co-founder and CEO of HomeZada, one of the simplest methods for determining your personal property coverage needs is through a home inventory. Not only will this help you determine if your contents coverage is adequate, but it can also help you identify any collectibles that could be limited or excluded under your homeowner’s coverage. These might include art, antiques, sports memorabilia, jewelry, and so forth. And should disaster strike, this personal property inventory can be handed over to an insurance adjuster, potentially speeding up the turnaround time for compensation related to any lost or destroyed items. Can you imagine trying to accomplish this after a loss has occurred? Finally, this process can help clearly identify any property used in business and whether or not you currently have adequate coverage in place. Josh Berman tells us that it’s “important to know the extent of your homeowner’s insurance liability coverage to make sure your personal assets are protected against a lawsuit.” How to go about this? Like we’ve mentioned in many of our previous insurance articles, your agent can be an invaluable resource. As Clifton Smith notes, “It’s a good idea to review your policy every few years with an agent to ensure your coverages are adequate. We try to meet with customers every four years to review,” and encourage them to ask questions. “In fact, customers who don’t ask questions are often the ones who are most upset during the claims process, since they assumed something was covered,” he says. What’s the Bottom Line About Potential Homeowner’s Insurance Coverage Gaps? In most instances, lenders require homeowner’s insurance in place; it’s typically a mandatory cost associated with home ownership. But unless you’re actively working with your agent or insurance carrier, as well as performing some legwork on your side, you might not be maximizing the overall value of your policy. Even worse, failing to do so could leave you underinsured in the event of a loss and on the hook for a lot of money. Before you go: Leave a comment below to start a conversation about your experiences with often overlooked homeowner’s insurance coverage options. Let’s carry this discussion about water over to the next section. Clifton Smith impresses that perhaps the biggest coverage omissions in a homeowner’s policy are for specific natural disasters like flood and ground movement (earthquake), although they can often be added back as a rider or a separate policy. Further, he notes that allowances for hazardous material abatement (asbestos, lead, etc.) and for building code upgrades (where an older home has to be brought up to current code) can be limited. Depending on your specific carrier, the state in which you live, and the type of policy you have, some of these coverage options might be available—or possibly increased, if limited—by endorsement. Here again is where your agent, or your direct company’s customer service department, can help. Is Your Home-Based Business Covered? According to Forbes, 52 percent of all small businesses are home-based. This isn’t necessarily a surprise since we’ve written extensively about working from home in the past. But what many entrepreneurs might not realize is that some business exposures can be specifically excluded from homeowner’s coverage—especially those related to customer traffic on premises, such as an accountant meeting with clients. Depending on the specific exposure, Troy Peterson mentions that this is generally an easy situation to address by adding an endorsement or taking out a separate business policy. Clifton Smith notes, “Most policies have a standard amount of coverage for business equipment in the home (usually a few thousand). After that, a commercial policy is probably necessary, especially if inventory is kept at the home.